It wasn't such a good debut for either of the two newcomers, as Glass topped the weekend for the second week in a row. The good news also came from several of the Oscar nominees as Green Book, The Favourite, Bohemian Rhapsody and A Star is Born all expanded and got some added love for their efforts. The Mule passed a a major milestone while Spider-Verse is on the verge of setting a record for Sony Animation. While it's likely to be one of the more quiet weekends of the year, at least there was some good news to go around. While not the biggest hit among critics or audiences, Glass still had little trouble retaining the top position at the box office. The film still dropped nearly 53%, adding $19 million for a new total of $73.58 million. That total still looks impressive next to its $23 million budget, even if it won't come anywhere close to matching Split's $138.2 million total. Still, it has already topped the likes of The Visit ($65 million) and The Happening ($64 million) and is just about to top Alien: Covenant ($74 million). It should also be able to top Unbreakable ($95 million) and get damn close to topping The Village ($114 million) by the time it ends its run. That is still an impressive total, especially for a film with mixed reactions. It has also earned $89.1 million overseas for a worldwide total of $162.7 million and should have no problem topping the $200 million mark in short order. It will still be another win for director M. Night Shyamalan and the big question is where he is going from here. Retaining its second-place position as well, the Intouchables remake with Kevin Hart and Bryan Cranston had an excellent hold, a top-12 best (not including films that expanded - see below) 18.4% drop, adding $12.24 million and giving the film a new $63.14 million total. It has its sights set on A Bad Mom's Christmas ($72 million) to become the second-best highest-grossing film for STX Entertainment behind just Bad Moms ($113 million). It has had minimal impact overseas ($6.1 million), but the $37.5 million film is sure to turn a profit as it will double its budget before long - and should add a bit more than that in the long run. Landing in third place is the seemingly unstoppable aquatic hero, dipping a light 28% and adding another $7.35 million to its total, which now stands at an impressive $316.55 million. That puts it ahead of Iron Man 2 ($312 million) and just below the original Iron Man ($318 million). If it can continue on its current pace, a total of $330 million seems likely - topping the likes of Suicide Squad ($324 million) and Deadpool 2 (also $324 million) and maybe Batman v Superman ($330 million). But the bigger news is Aquaman's international presence, where it has earned $1.085 billion worldwide - passing The Dark Knight Rises ($1.084 million) to become the biggest DC film of all time on that front. It is also the third-biggest Time Warner film, behind just The Lord of the Rings: The Return of the King ($1.119 billion) and Harry Potter and the Deathly Hallows Part II ($1.342 billion) as well as landing in the 25th place on the all-time list. I guess James Wan is the guy to call if you want to give your franchise new life - as he also gifted the world the highest-grossing Furious 7 ($1.5 billion). Aquaman has plenty left in the tank and it will be interesting to see where it finally lands. 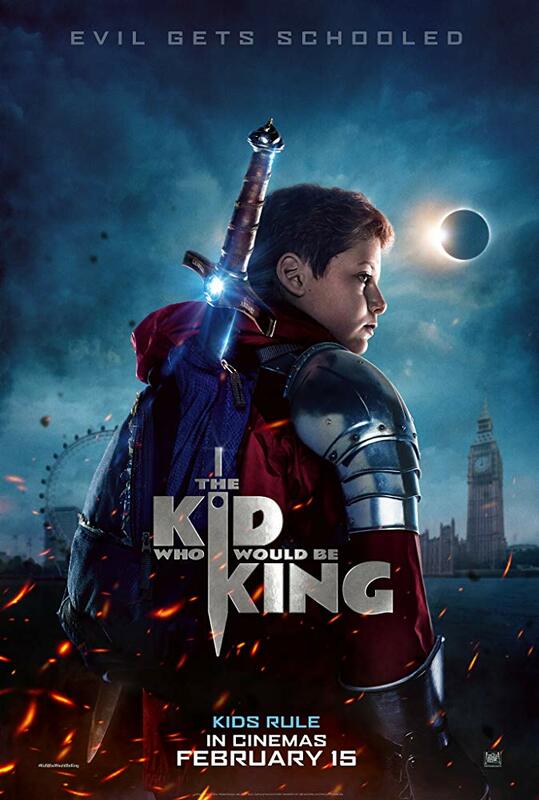 Cracking the top five, but not exactly in the most impressive fashion, the kid-friendly Arthurian tale had to setting for a $7.25 million opening. There is a chance it could switch places with Aquaman when the final tally is counted, but even if it adds a bit more, it's not exactly an auspicious opening for the $59 million-budgeted film. The film did earn a "B+" Cinemascore from an audience that was 53% female with 53% also coming in 25 or older. Once again, it's another version of King Arthur that just couldn't connect with audiences and the PG rating failed to bring in much of a family crowd. I guess when you have Aquaman and Spider-Man to compete with, pulling a sword from a stone just isn't all that impressive. It's not burning up international audiences, either, thus it seems this will be another forgotten Arthur story - a common theme for such a legendary story. Once again landing in the fifth-place spot, Spider-Verse dipped a light 18.8%, bringing in $6.15 million and raising its total to $169 million. That puts it less that $700,000 away from topping Hotel Transylvania 2 (which it should have no problem hitting tomorrow) to become the highest-grossing domestic film for Sony Animation. It is looking to earn 5.2x its $35 million opening - an amazingly leggy film, especially if it continues winning on the award circuit. A total of $180 million is likely and it should have no issue earned 4x its $90 million budget worldwide, likely topping $400 million (it sits at $338 million right now). It has also topped Mary Poppins Returns ($165 million) to become the second-biggest hit out of last December, trailing only Aquaman. No matter what way you slice things, this is a mighty fine result and points towards a great future for this franchise. Outside the top five: With little fanfare and marketing, the Matthew McConaughey, Anne Hathaway spicy thriller had a pretty bland opening with just $4.8 million (8th place). It was savaged by critics and audiences gave it a "D+" Cinemascore, which means it isn't long for this cinematic world. It will join Replicas for the ignoble distinction of being the second film of 2019 to open on over 2000 screens yet earn less than $10 million. In much better news, it was all smiles for the recent Oscar nominees as Green Book led the way, adding over 1500 screens and jumping a huge 150% and going from 14th to 6th place in the process with a $5.4 million weekend and a new total of $49 million, doubling its $23 million budget. It will hit $50 million in another day or so and now leads the pack among the late-season award darlings. But the good news didn't stop with Green Book as The Favourite added over 1000 screens and jumped from 18th to 13th place (an increase of a whopping 214%) adding $2.56 million for a new $26.12 million total; Bohemian Rhapsody enjoyed a modest 7.6% increase adding $2.47 million and giving it a new $205 million total (as well as topping the $800 million mark worldwide); A Star is Born added 777 screens to get a 106.6% increase, remaining in 20th place with $1.26 million and a new $206.32 million total. It looks like Bohemian Rhapsody will ultimately come out on top between the musical behemoths once the dust settles. In milestone news, The Mule became the fifth $100 million earner for Clint Eastwood (the actor), just crossing the mark with $1.64 million (17th place) and a new $100.1 million total. Next week Miss Bala will be the only new wide release, before the floodgates really open in February in subsequent weeks.